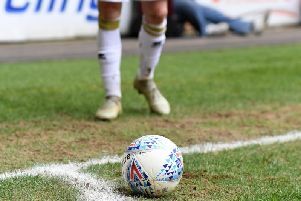 MK Dons made it four points from nine over the Christmas period as they battled to a 0-0 draw with Chesterfield at the Proact Stadium on Monday. After a dour first half, void of changes and quality, Dons grew into things when they made chances in the second half, with Nicky Maynard and substitute Daniel Powell forcing Ryan Fulton - by far and away Chesterfield's man of the match - into two excellent saves. The result leaves Dons still 18th in the table, with the gap to Gillingham above cut to two points. Prior to kick off, boss Robbie Neilson confirmed Samir Carruthers was in advanced talks with another League 1 club and thus missed out on the trip to the Proact Stadium. He was the only change to the side which started against Swindon in the final game of 2016, but was replaced by Darren Potter as he returned from suspension. Both sides are battling at the wrong end of the League 1 table, and it certainly showed in the opening half hour. Lacking in quality and edge, the chances were few and far between. Ed Upson had two attempts - one of which came from just inside the Chesterfield half - which barely gave Ryan Fulton much to worry about, and Ched Evans scuffed his volley as the game fairly drifted. There was a bit more action as half time loomed though, with veteran defender Ian Evatt having his header cleared off the line by Ben Reeves, but for all Dons' possession, they barely threatened. None of the front trio of Maynard, Agard and Aneke could carve themselves a chance, with the ball bobbling around off toes and shins as they struggled to make an impact. As the game continued to drift in the second half, Aneke and Agard were replaced by Daniel Powell and GC Williams as Neilson reverted to the tried and tested 4-2-3-1. It didn't bring about much of a change though, but a moment of quality from Maynard almost broke the deadlock with 17 minutes to go with an acrobatic overhead kick, equally well stopped by Fulton. Powell and GC Williams though grew into the game as Dons began to force the issue in the closing stages. Twice Powell found himself with a sight of goal, forcing Fulton into another great save, before blasting one over from a good position. The game though was destined for 0-0, and neither side fully deserved to take the full compliment of points.